Remember when Betty Who released a smash album last year and everyone bought it and loved it? No, me neither. It’s almost not a surprise, though, when 2015 also brought us Carly Rae Jepsen’s ‘Emotion’, a similarly pop heavy album that achieved critical success but comparatively failed commercially. ‘Take Me When You Go’ is the Australian singer’s debut album, released with a whimper and largely forgotten since. That’s a real shame when the material is so strong. “If you’ve got a broken heart, then you’re just like me”, Who sings on opener Just Like Me. Here is a popstar posing as ‘normal’, singing relatable lyrics to upbeat, fizzing pop melodies. She’s like Robyn meets Katy Perry, which is surely no bad thing. Broadly, her songs fall into three categories. Most common are the fun, synthy, 80s inspired tracks – High Society, Glory Days, Somebody Loves You, All Of You – that are bright and catchy, with choppy rhythms and boundless energy. Then there are the ballads, where Who genuinely opens up her heart over warm textures and gentle guitars, her voice taking the fore. The simple imagery of, say, Missing You (“You call and all I wanna do, all I wanna do now is be there with you”) is easy to fall for, whilst Silas on the album’s deluxe version is touching and experimental for such a pop-focused artist, not to mention the stark California Rain that closes the album proper. Best of all is when these two styles merge – sad-pop if you will. Dreaming About You may seem like a loving fantasy at first, but lyrically it takes a darker turn in the chorus, ending with “I just wanna leave us behind”. And whilst Alone Again may be based on funky production, it’s imbued with a sense of longing that may never be fulfilled. The sad-pop dichotomy is neatly summed up in Heartbreak Dream – “In a moment, you were everything to me” begins the chorus, before the song breaks down into repeated “you keep breaking my heart”. So why didn’t the album succeed? There are a number of possibilities for that. Perhaps it’s due to a lack of marketing from the label, the album receiving little coverage and not even impacting the UK charts. Perhaps it’s because much of the album has already been heard on Who’s previous EPs and is easily dismissed (*hands up emoji*). Perhaps it’s because the order of tracks is all wrong, weirdly grouping together its upbeat and downbeat songs. Or perhaps it’s because the influences are so clear – let’s face it, the hook of Runaways is a brazen recreation of Pitbull and Ke$ha’s Timber. Most likely, though, is that there simply isn’t an appetite for this sort of pop as Carly Rae can also attest to, especially in this age of overtly sexualised R&B and hip-hop. Sure, ‘Take Me When You Go’ is frothy and perhaps even shallow, but you’d be hard pressed to find an album with such exuberant joy. Who provides us with escapism to Glory Days of High Society where Somebody Loves You, but where it’s also ok to be Dreaming About You. If you missed this last year, it’s time you gave it a go. 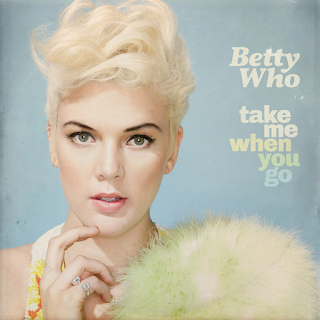 Listen: ‘Take Me When You Go’ is available now.